For me, the dish is all about the sauce–it’s essentially a curry flavored Chinese noodle stir fry. Two of my favorite cuisines (I probably say that of all the cuisines), Indian and Chinese, in one flavor packed dish! So I can’t say I make the most traditional version of this dish, since I don’t bother substituting the meat or the fish sauce. The dish is also traditionally made with rice vermicelli noodles, which I may or may not use, depending on what I have in my pantry! 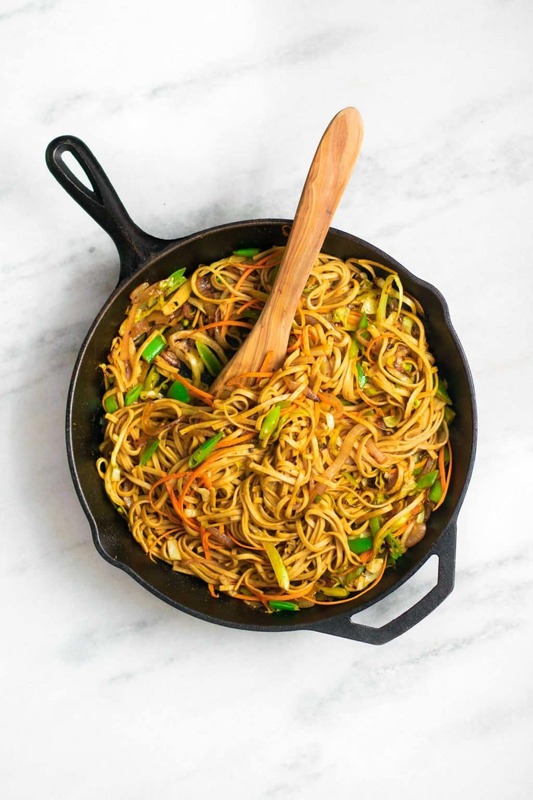 This is a super versatile stir fry, and our go-to dish when we’re running low on produce and pantry items and are feeling super busy or lazy. It’s ready within 30 minutes AT MOST, is easily scaled up to feed more if you need (though I’d probably fry in batches in that case). We use whatever produce we have, or maybe just onion if we’re out of everything else. For protein you could throw in fried tofu or seitan, chickpeas or soy curls. It doesn’t seem to matter what you put in the recipe, as long as you have some kind of noodles and that sauce it comes out amazing! The sauce is a simple 6 ingredients. Soy sauce (use tamari if gluten free), shaoxing chinese cooking wine (you can substitute sherry wine or sherry vinegar), agave nectar (or maple syrup or just a bit of sugar), toasted sesame oil, an Indian curry powder, and white pepper. 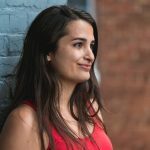 All of those ingredients can be found at your regular supermarket, with the exception of the Chinese wine, which would require a specialty asian grocery store. However, you can, and I have, substitute sherry for a delicious dish. If you do go out of your way to find shaoxing wine it’s well worth it, plus you can use it in so many recipes, including my broccoli and tofu stir fry with black bean sauce! The sauce ingredients combine to form a super flavorful stir fry, best when combined with onion and a healthy dose of both garlic and chilies. The final dish is super spicy (seed your chiles and/or use less if you don’t like your food to be spicy–or add more chilies if you want it to be burn your mouth hot), super flavorful. Super quick to make, super adaptable to whatever you have in your pantry and fridge, basically all around super! 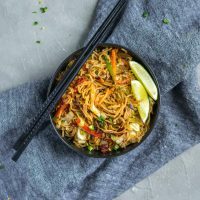 I hope you try making your own Singapore noodles and that the recipe becomes as much of a staple dish in your home as it is in ours! If you do make it, let me know and tell me what veggies you used! Leave a comment and/or rate the recipe below, tag me on Instagram (or #thecuriouschickpea), or share with me on Facebook! Happy eating! ETA: I gave this dish a refresh with new photos and an updated and streamlined recipe. The original recipe used udon noodles which are not traditional, and makes the dish gluten-full. 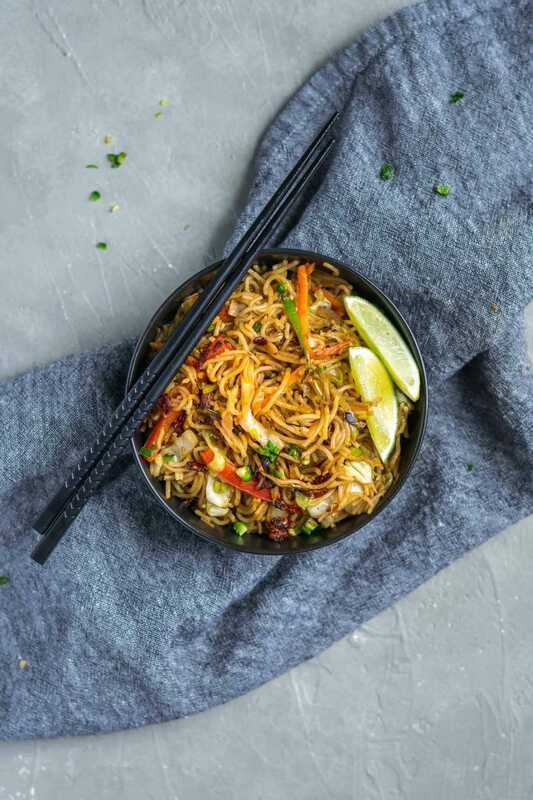 Traditional Singapore noodles are made with rice vermicelli which the new photos and recipe reflect. Make sure to use a gluten free soy sauce (like Tamari) if you are avoiding gluten. 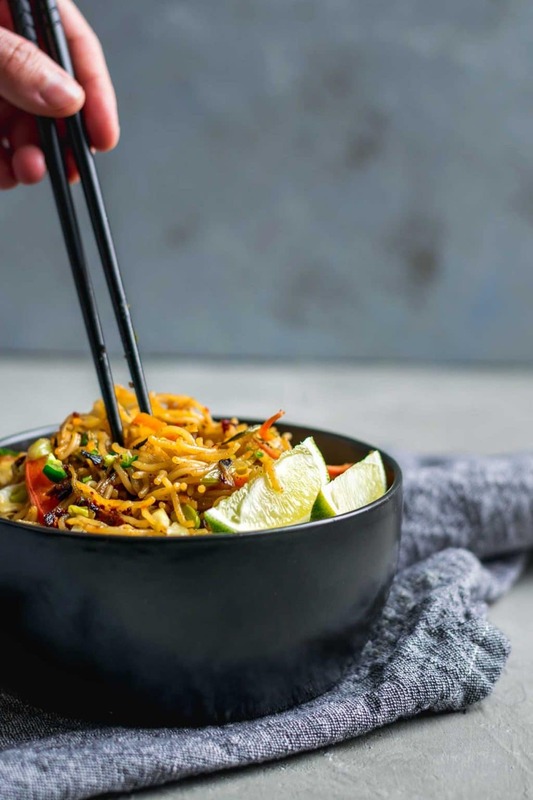 This photo also reflects real life: I love the versatility of this curry Chinese sauce and noodle stir fry, and will use it in combination with whatever noodles and produce I have in my pantry and fridge! Use whatever vegetables you have, we’ve made the dish with baby corn, broccoli, collard greens, cauliflower, green beans, kale, bok choy, zucchini, well, you get the picture. Just make sure to add veggies you want to cook a little more when you’d put in the cabbage and veggies you want barely cooked in at the time of the sugar snap peas. Add some protein to this dish if you’d like. Stir fry some shredded tofu, add some seitan or beans. Crumble in some tempeh. It’s really up to you! 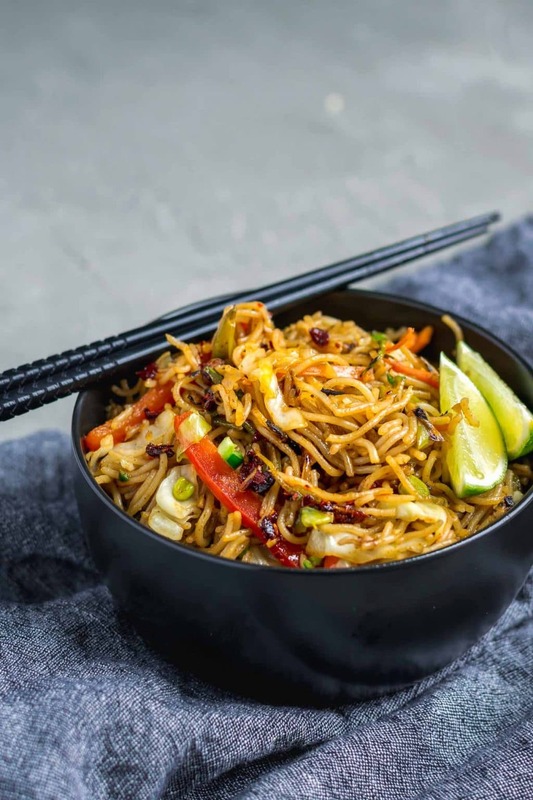 A vegan take on the popular Chinese stir fried noodle dish spiced with curry powder. In a small bowl or a liquid measuring cup mix together the sauce ingredients: soy sauce, chinese wine, toasted sesame oil, agave nectar, curry powder, white pepper, garlic, and chilies. Set aside. Heat a wok over high heat. Add the oil and onion when hot and fry 1 1/2 - 2 minutes, stirring constantly, until the onion is charred and soft. Add the cabbage and cook for about 2 minutes, stirring almost constantly, until it is wilted and lightly charred. Add the sugar snap peas, carrots, and bell pepper and cook for 1 - 1 1/2 minutes until the vegetables have charred a little. Add the noodles and the sauce and fry for about 2 minutes, stirring constantly to distribute sauce and prevent sticking. Squeeze fresh lime wedges over the noodles to serve and garnish with sliced scallions or additional minced chiles if desired. You can cook the stir fry in a large skillet, but cooking times will be a bit longer. Cook over medium-high heat and expect to up to double the cook time. Looks so yummm! If I may ask which brand of curry powder did you use here? We used one from the Indian grocery store, SWAD brand. And we love the madras curry powder in particular. I also really enjoy Whole Foods vindaloo curry powder, though the flavor is quite different. Any should work nicely! I’ll use Thai chiles (sometimes they’re red and that’s cool too) if I can find them, otherwise serrano chiles are good and also typically less hot. This was excellent! I left out the chilis (our kids don’t like spice), but it still had good kick with the curry. We’ll be making this again soon! I’m so glad you enjoyed the recipe Molly!